I hope the information below will be of some help to you. Some Kitchen Taps handles can be a little different to take off. If you are in any doubt about CHANGING a Kitchen Tap Valve – do contact a professional plumber. 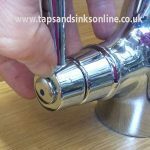 If you have the Franke Planar Tap we have some further tips here. Check out the Tips and Tricks in our Kitchen Taps Troubleshooting Guide for other common Kitchen Taps Problems (with solutions). 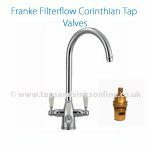 If you don’t know which valve to order, please read our blog – I don’t know what valve I need to fix my dripping tap. Make sure to turn OFF the hot and cold water supply to the Tap. With a lot of Kitchen Taps the hot and cold indicators on the handles can be “popped” off with a screwdriver or unscrewed by hand. 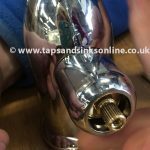 Here is a more detailed blog too How to remove the Handle on your Kitchen Tap. Note: We would strongly recommend trying first with something small e.g very small glasses type screwdriver or your finger nail to avoid scratching the surface finish of your Kitchen Tap. When these are removed you will be able to see a small brass screw in the centre of the handle. Unscrew this and you should be able to remove the handle. Where there is no indicator to pop off: check UNDERNEATH the handle as often the screw is there instead. When the handle is removed there may still be a shroud (valve cover) covering the valve. This can be removed by either twisting off anti-clockwise OR there maybe a grub screw on the underside of this cover which you will remove with an allen key. Then the valve should be exposed. Also here is a more detailed blog How to remove the handle on your Kitchen Tap. Shroud still covering the Valve which also needs to be removed. 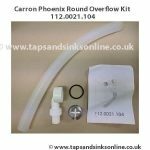 Perrin & Rowe recommend for their taps / Franke Triflow models: If you cannot remove the hood (shroud) that covers the valve due to build up of limescale – try soaking it for max 30 mins at a time in a solution of 50% lemon juice and 50% water. You can repeat this as often as required provided that in between you completely wash away the solution. With the spanner loosen the brass Valve (this may be very tight in older kitchen taps so try some WD40 on the area if you have no luck). You loosen it anti-clockwise under the “splines” (the part the handle attaches to). It is there that (on the Nut part of the valve) that you attach a spanner or a wrench. You screw a valve out ‘anti-clockwise’ – which means on a standard 2 lever tap where you pull both levers towards you to turn on, and push back up to turn off (and hot on the left and cold on the right – on the hot side you have to push away from you i.e. towards the wall behind the tap, and for the cold side to loosen the valve you would have to pull towards you and downwards to loosen the valve . [Note, to screw in a valve it goes in ‘clockwise’ which is the reverse of what you do to loosen the valves]. As you loosen the Valve some water may start to ‘seep’ out. Don’t panic. It’s just some water left in the tap chamber (P.S. some taps have a brass bush that surrounds the Valve and it may come out with it. Replace the old Valve with your new Valve and tighten it into the body of the kitchen tap (You don’t have to over tighten). Then all you have to do is replace the handle, re-tighten the small brass screw and replace your indicator. Turn your mains water back on. Browse Our Taps Parts – Click Here to purchase Taps Spare Parts you need! Hi. 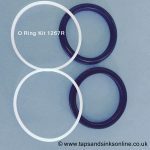 I just need a pair of silicon washer gasket inserts to stop a drip from my Franke Olympus mixer tap. The valve has ‘san marco 2006’ stamped on it. Can you supply or do you have a suggestion? we can supply the replacement valves that you need (genuine spare parts) . We don’t supply ‘parts’ of valves. You just have to establish if the drip is coming from the hot or cold side – so try running the hot water and then turn off and see if your drip remains hot (then most likely the hot valve) or if it turns cold then most likely the cold. If you click here it will bring you to the Franke Olympus Valves that you need. I have a replacement valve for the Franke Zurich tap, however, the brass bush has come out when I unscrewing it. Wasn’t sure how to remove this and replace the valve. Is this recommended or should I change both. If so how do you remove the bush? 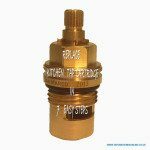 If you cannot separate your valve from your brass bush then your only option is to buy the brass bush. Caple lam2 tap – do you know how the ceramic cartridge is held in place/removed as there is no thread on the cartridge? You’re welcome ! Glad that it helped you. Hi, bought new cartridges from you for my Alba tap. Can’t see how to remove the lever end hot or cold caps to get at interior. Have tried prying off and attempting to unscrew them but they seem to be very slightly smaller diameter than the lever body. Any suggestions? Are they screw off or pop off? Getting a bit frustrated. HI Nick, the blog post Kitchen Tap – How to remove the Valve Cover will answer your query. 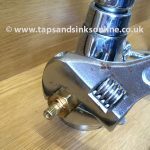 Also see our Blog Post How to remove the handle on your Kitchen Tap. .
After replacing the cold valve I found limescale has worn the cold handle splines so it won’t grip the valve splines. Any ideas the get a decent grip. The grub screw won’t hold the tap enough. In this case, if the splines inside the handle itself are worn you would be best placed to replace the handle as well. If you tell me what Tap is was that you purchased the valve for, I can see if we have a replacement handle here in stock. Email details to sales@tapsandsinksonline.co.uk. I need to replace the valves for my Franke Zurich tap and have taken the hot and cold buttons off and unscrewed but the handles still won’t come off. Any suggestions as to what I am doing wrong? Hi Philipa its just possible that the handles have seized on the valves due to debris etc in the water over time. Hi, my franke eiger mixer tap in my kitchen is dripping from the cold handle! Any ideas, is this still just a valve replacement ? Yes, as per our Blog Link Kitchen Mixer Tap is leaking from the Handle. Here is the link to the Franke Eiger Kitchen Tap Valve. Take note regarding the Brass Bush as well. 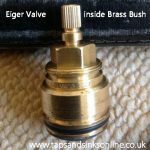 What would be useful is if you were to remove your own Valve prior to ordering and that way you would know whether or not you require the Brass Bush as well. 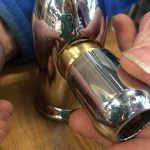 If you don’t want to do this / it will be a plumber, then you could also order the Brass Bush (as this is one Tap that the Brass Bush often comes out stuck to the Valve) as any unused parts can be returned within 28 days for a full refund excluding shipping costs. Kind regards, Alice. Dear Delphine here is the link to the Franke Modern Triflow Tap Valves. If you click on this link it will take you into the Valve to purchase it. You need to order the Cold Valve but I can’t tell you whether it is the Cold Filtered or Cold Mains (only someone who can isolate each feed separately and then test again for a drip would know that). It could be either valve or both. Any parts unused can be returned within 28 days for a full refund excluding shipping costs. Our shipping and returns details are on the product details. I’m following your instructions in trying to replace a leaking valve on my Franke Filterflow Doric but there do not appear to be grub screws to unscrew in order to remove the tap handle? Does this mean the handle should just slide off – I am wary of attempting to force it. Please advise. There should be a grub screw at the back of the base of the spout. Its on the installation guide. Dear Mike, have you tried the lemon / water solution that the manufacturers of the tap recommended ? I also know that TTOil can penetrate far better than WD40 but I would try what the manufacturers of this Tap recommend themselves first. Can you let me know how it goes? I can also find out if Shrouds are available and revert to you on this one too. I have a Franke Md Olympus Minimalist Tap Ss (brushed). It is 3.5years old and is dripping from the spout. Please could you advise on the valve ( brush?) part that I will need to replace, I would like to order the parts and get it sorted ASAP as it is very annoying ! Dear Louise – is this the Tap that you refer to here ? My Franke Olympus Tap is dripping. This will cover all the parts that are needed and give you links to them. If your Tap is dripping from the Spout it usually means replacing a valve – Hot, Cold or Both. Also watch out for the Brass Bush which is a part that the valve sits into inside the Tap. It can often come out WITH the Valve as if it is one part (whereas in fact it is two separate parts i.e. Valve and Brass Bush). If your valve looks fatter than the valve ordered, that would be the case. There are pictures of this on the blog post as well as on the Valve Products. We recommend that customers remove their own valve prior to ordering to see whether or not they also need to replace the bush as well (to save on unnecessary shipping charges). Any unused spare parts can be returned and on every product is a link to our Shipping / Returns policy in detail. This Blog Post How to tell which Valve needs replacing : Hot or Cold? might help. need to replace valves on my Franke Ascona tap but the valves have two flat sides and it is almost impossible to get a spanner in and apply enough pressure .any removal tips ? HI Brian – can you take a picture – several – of where exactly you are stuck – and I will do my best to assist you. Kind regards Alice p.s. mark the pictures FAO Alice – and take them where you get as far as you have described above. Have been trying to remove the leaking cold tap valve cap from a Franke Ascona tap but cant find the right size allan key. Can you help ? Hi, I’m trying to remove the handle on my franke eiger tap and I need to know the size of the Allen key I need. HI Malcolm, it’s usually 2mm for the grub screw on the handles and 2.5mm for the grub screw on the o ring kit. We have Allen key packs that contain both which you can order here to cover all sizes in case the manufacturer has made any modifications. Hi i have a Franke wave pull out mono mixer kitchen tap . Its 2 and a half year old. Its dripping and my concern is that i am on a water meator . Can you help i know nothing whatsoever anout plumbing . My brother in law says i may judt have to buy a new one . This tap is advertised as having a five year guarantee. I cant find the psperwork , my partnrt dealt eith it and had passed away. I would be grateful for any advise you give ad i really like this tap . I have removed the handle on my Franke Ascona tap, but it is clear that I need to remove the shroud before I can get any spanner on the valve. How can I remove the shroud please? There is no shroud. You should be able to see your valve once you remove the handle. If your Tap has the original mini valve SP3308, it has two flat sides, and there is a removal tool to remove it. If you have the later 6 sided valve, the SP3794, then you shouldn’t even need this tool. Please note that the SP3308 has been discontinued and has been replaced by the 6 sided mini valve, SP3794 (or 3794R). So when you order the Ascona Valve, this is the Valve that you will receive. This is a change made by the Franke Ascona Tap manufacturer. Thank you. However, there is a snag, What you say is true of the latest Ascona model but older models have an extended shroud that hides most of the valve making it impossible to get a purchase on the valve. I have decided to go for a new tap! do you want to email me a picture of what you are referring to. 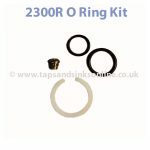 If we think that it can be sorted by using the tool 4013R – cheaper option than replacing a Tap, I will get back to you. I dont see any shroud listed in the Ascona Installation guide. I’ve got a Franke Bern Tap that is leaking from the tap. The cold doesn’t appear to be shutting off. I’ve removed the handle to expose the valve, I’ve been thinking of buying the valve from you guys, will I need anything else for this job? Hi Chris , depending on whether you have the original valve SP3308, which has two flat sides on the valve, then you might require the SP3308Removal Tool 4013R. If you have the later six sided valve SP3794, then you won’t require this tool. Here is the link to the Franke Bern Tap Valve. 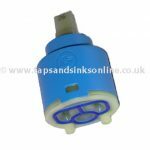 All our Franke Spare Parts are genuine. Thanks Alice, I have ordered one from yourselves. I managed to remove the old one this morning and attempted to clean it up by removing the lime scale. It has made an improvement but it\’s still dripping slightly. Thanks for your help. You are very welcome. Here is a troubleshooting guide that might be of help to you when fitting the new valve. Mind that you don’t overtighten it. Some Tap manufacturers recommend tightening by hand and only to tighten the last 1/4 turn with a spanner. 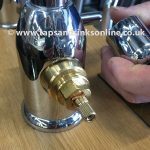 We have a Franke Kubus Filterflow fitted 2008 which has been dripping from the spout end-no sign of leakage from the tap barrels. The washer in the splashguard is wrecked so my question is would that be responsible for the leakage problem or will it be in one of the valves? If valves then am I correct in thinking that the tap handles have to be unscrewed (they act as a grub screw?) but then how do the tap and shroud get separated from valve itself? HI Michael, if your tap is 2008 then its more likely that you have the Kubus Triflow (not filterflow). I am going to email you on the installation guide and see if that helps. If it doesnt, email me back and I will contact the manufacturer – let me know exactly where you are stuck once you have read / tried the installation guide. Also usually the spout dripping does mean the valve but you also have 3 valves so it could be any of them. Ideally you would stop the feed into each of them in turn to isolate which one is dripping. Take a look at the installation guide and see how you get on. The Aerator is not designed to stop the Tap dripping. Hi I have a Perrin and Rowe Phoenician 4460 in pewter I am trying to replace the ceramic disc valve, but cannot get to it can you help in telling me how to do this. Carron Phoenix Victoria tap dripping. Website suggests whole valve needs to be replaced. Surely a replacement washer is all that’s needed? Hi Andrew, it depends on where your tap is dripping from but we do recommend, if dripping from the spout , to replace the valve, Cost £14. I don’t know what you mean by replacement washer ? We believe that it is prudent to replace the entire valve which includes rubber seals and ceramic dics inside it as you don’t know which part of the valve has been worn. The manufacturers of these taps concur as they do not supply ‘parts’ for valves, but supply the entire valve as one part. When I remove the outer lever to access the valve it ‘doesn’t want’ to come out. Should I just pull it out forcibly? There’s nothing obvious to loosen or remove to get the valve out. Everything on that Davos tap was sooooooo tight for dismantling. Even the shroud/tap-handle had to levered off rather than just pulled. If I hadn’t been confident that I was doing it right, thanks to you, I’d have presumed that I must be doing something wrong as nothing appeared to be moveable. I think I have a Perrin & Rowe Ionian two hole sink mixer with porcelain handle some. I can’t see any screws holding the tap heads on. Do I just undo the shrouds and pull off the tap and shroud together to get at the valve. Hi Jon, here is the link Valve Vernier Insert Changing Procedure for Perrin and Rowe Lever Taps . Can you email me picture of your tap as well for completeness.